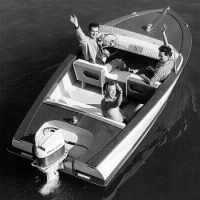 I'm new to the forum and wanted to stop by and say hi after deciding to finally "go for it" and build a couple boats that I've always wanted to do. i have decided that the first one will be a jet TNT (because i think it'd be a great first build experience and it puts me in the mind of a water-bound go-kart which should be a blast!). I received the patterns and plans a couple weeks ago and i'm currently eyeball-deep in the modification planning stage. I'm really glad that the forum has this jet ski power section and I've already gotten some really good ideas from all the great projects on here. Welcome to our community, DSR. And thank you for posting info on your alterations to our "Tiny-N-Terrific"! Should be a fun build!! See if Chris can get you some Philippine mahogany. It's nicer to work with and a bit lighter. Sometimes he has it in stock. Johnsons is a great place to deal and you will get quality products. I've been building cars for years but I've been wanting to build a couple boats for a long time and have finally found the opportunity to make it happen. I'm more than a little excited about it! So Chris is the guy to see at Johnson's Roberta? Very good to know. 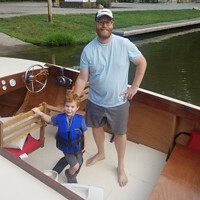 With your experience and craftsmanship building boats (I can only hope mine turns out half as nice as yours), a thumbs up from you means a lot and gives me confidence in who I'm dealing with. And Gayle, thank you so much for continuing with a company that is probably the most customer focused of any I've ever had the pleasure of doing business with!! Love the sketch Dave - Kinda like a mini Van Dam Alpha Z! Looking forward to watching the build - Good luck! Thanks for the kind words and I'll make sure to post pics as I go along. Ha ha - I know what you mean. Van Dam boats are something else, but I recon that by tweaking some of Glen-L's designs, you could get 80% of the boat for about 10% of the money - That's what I'm hoping anyway, Haha. What a great way to spend a Saturday afternoon !! After 3 months scouring through salvage auctions, eBay, Craigslist and anywhere else I could look, I just made a 1062- mile round trip to Nashville TN yesterday to pick up the next piece of the puzzle! A wrecked 2004 Honda R12X Aquatrax with only 66 hrs. on it for the engine and pump to power the little beast. I peeled it apart to inspect the powertrain and everything is in perfect condition, the hoses look and feel brand new and the pump impeller looks brand new with no dings or other marks on it. So after I pull it apart and finalize the dimensions for the build, I'll be headed back to Johnson's Workbench for the wood,get the SB fasteners and epoxy and start building!! Oh yeah, and I'm a couple pieces shy of having a vacuum-bag setup going also! Hi there. I finally found the time to get the ski running! The darn thing fired right up on the first revolution and settled down into probably the coolest sounding idle I've ever heard from a 4 cylinder engine with a bit of a "big cam" lope and you can even hear a little turbo whistle. It sounds really good. Touching the throttle, my first thought was "oh boy, this is going to get VERY interesting......". The throttle response is simply insane! Granted, there's no load from the pump, but this thing will go from idle to 6 grand and back to idle in literally 1 second!! Holy smokes! I've never really messed with jet skis and didn't have any idea what to expect, but I wasn't expecting that! This is going to be a whole lot of fun!!!! Last edited by DSR on Fri Nov 04, 2016 2:50 pm, edited 3 times in total. Best part is it's a Honda! Congrats on a great find. This lil TNT is going to FLY! Those Honda guts will look way better in your TNT!